Specialising in the finest cookware from home and abroad, Brennan’s Cookshop in Cork has over 100 years of experience in the food industry. Brennan’s also offers a variety of cooking classes that range from classical gourmet to specialist dietary requirements. There is also a wine tasting course which allows you to explore the delights of coupling the right wine with the right dish. In 1994, Brennan’s Cookshop moved to 7 Oliver Plunket Street, Cork and it has been their home since. 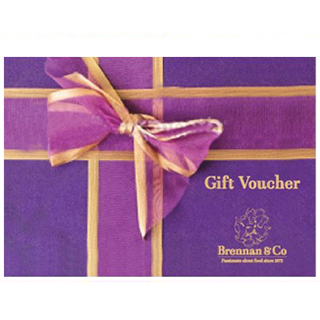 How it Works: Use this gift voucher on AllGifts.ie to order gift cards for use in Brennan’s Cookshop in Cork. Or you can swap this voucher for any other gift or voucher listed on AllGifts.ie. Brennan’s Cookshop gift cards are posted out once ordered. Brennan's Cookshop gift cards are posted out free of charge once ordered. We are located in the heart of Cork city, on 7 Oliver Plunkett St Cork, a short distance from the GPO. Brennan's Cookshop cards are available in any denomination from €25 upwards. Minimum gift card value is €25. Brennan's was founded in 1872 to meet the needs of the professional and enthusiastic amateur caterer alike. Throughout the 20th century, Brennan’s Cookshop was renowned for its high quality glass, crockery and cutlery. In 1994, Brennan’s Cookshop moved to Oliver Plunket Street, Cork and it has been their home since. Today, in our Cork city centre store we specialise in the finest cookware from home and abroad. In addition, our Let's Cook cooking classes are achieving fantastic popularity. Courses range from classical gourmet to specialist dietary requirements. We also hold a wine tasting course, which allows you to explore the delights of coupling the right wine with the right dish. Brennan's Cookshop Gift Cards are posted out free of charge, normally within 5 working days. If you choose to collect your your Brennan's Cookshop Gift Card, you will need to get confirmation that the card is ready for collection before you go to collect. You will be asked for photo ID on collection.